A starter pistol which can be converted to fire live ammunition is to become illegal from 4 June. Olympic .380 BBM revolvers that were adapted to fire real bullets accounted for 18.5% of firearms seized by the Metropolitan Police last year. Imports of the Italian-made pistol were halted last month because of the ease with which the gun can be converted. Police have urged owners to hand in their pistols during an amnesty before the ban begins. After 4 June the weapon will be prohibited under the 1968 Firearms Act and anyone caught possessing it faces a mandatory prison sentence of five years. Police in 13 forces across England and Wales have recovered 179 of the converted pistols since 2007, with the bulk being found in London. Others were recovered in Bristol, Manchester and North Yorkshire. 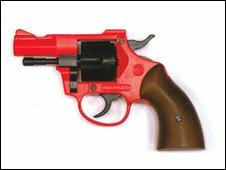 The bright red pistol can be bought legally over the counter in sporting shops and on the internet for around £90. Once it has been converted and painted black it can be sold to the underworld for more than £500. Speaking at the amnesty launch, Assistant Chief Constable Sue Fish, the Association of Chief Constable's spokeswoman on firearms, said a converted Olympic .380 BBM had "not yet" been used to kill but action was needed because it was so easy to convert. "The status of this firearm has changed. It is the only one, to our knowledge, to date that has been used to cause significant harm through its criminal use," she said. It has been linked with at least three attempted murders and represented "a significant threat to public safety," Ms Fish added. She said she did not want to criminalise "the vast majority who purchased it quite legitimately" and appealed for those who bought the model to start races or for dog training to hand it in. David Penn, of the British Shooting Sports Council (BSSC), backed the amnesty. He said: "The actions of a criminal minority have undermined the lawful use of this revolver and we appeal to anyone in possession of an Olympic .380 BBM to hand it to their nearest police station." Police have not ruled out reclassifying other starter pistols at a later date but saying the BBM had been singled out because it was so easy to modify.